The 1943 issues were designed and produced in India by an unknown designer. The 1953 and 1955 coins were produced by British Royal Mint, designed by Humphrey Paget. KM#107 4 Fils. Year: 1943-I - AH 1362. Weight: 4.00g. Metal: Bronze. Diameter: Scalloped, 21 mm. Edge: Plain. Alignment: Medal. Mint: Bombay Obverse: "Al Mamlakah" (Kingdom) written above. CE year on left and AH year on right. Value in center circle. "Al-Iraqiyah" (Iraq) written below. Reverse: "Faisal Al-Tani" (Faisal the Second) written right side anti-clockwise. "Malik Al-Iraq" (King of Iraq) written left anti-clockwise. King Faisal II facing right. Engraver's initials below bust. Mintage: 1,500,000. Minted Years: one year type. 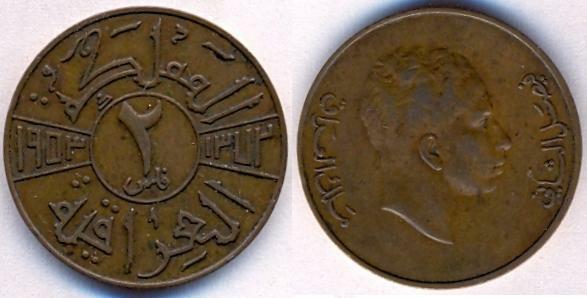 Faisal II, Regency coin. KM#108 10 Fils. Year: 1943-I - AH 1362. Weight: 6.75g. Metal: Bronze. Diameter: Scalloped, 25 mm. Edge: Plain. Alignment: Medal. Mint: Bombay Mint. Obverse: "Al Mamlakah" (Kingdom) written above. CE year on left and AH year on right. Value in center circle. "Al-Iraqiyah" (Iraq) written below. 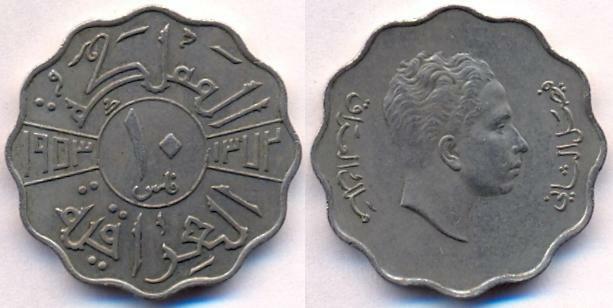 Reverse: "Faisal Al-Tani" (Faisal the Second) written right side anti-clockwise. "Malik Al-Iraq" (King of Iraq) written left anti-clockwise. King Faisal II facing right. Engraver's initials below bust. Mintage: 1,500,000. Minted Years: one year type. 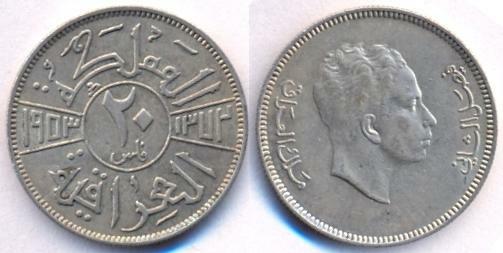 Faisal II, Regency coin. KM#109 Fils. Year: 1953 - AH 1372. Weight: 2.50g. Metal: Bronze. Diameter: 19.5 mm. Edge: Plain. Alignment: Medal. Mint: British Royal Mint. Obverse: "Al Mamlakah" (Kingdom) written above. CE year on left and AH year on right. Value in center circle. "Al-Iraqiyah" (Iraq) written below. Reverse: "Faisal Al-Tani" (Faisal the Second) written right side clockwise. "Malik Al-Iraq" (King of Iraq) written left clockwise. King Faisal II facing right. Mintage: 41,000,000 + 200 Proofs. Minted Years: one year type. KM#110 2 Fils. Year: 1953 - AH 1372. Weight: 5.00g. Metal: Bronze. Diameter: 24 mm. Edge: Plain. Alignment: Medal. Mint: British Royal Mint. Obverse: "Al Mamlakah" (Kingdom) written above. CE year on left and AH year on right. Value in center circle. "Al-Iraqiyah" (Iraq) written below. Reverse: "Faisal Al-Tani" (Faisal the Second) written right side clockwise. "Malik Al-Iraq" (King of Iraq) written left clockwise. King Faisal II facing right. Mintage: 500,000 + 200 Proofs. Minted Years: one year type. KM#111 4 Fils. Year: 1953 - AH 1372. Weight: 4.00g. Metal: Copper-Nickel. Diameter: Scalloped, 21 mm. Edge: Plain. Alignment: Medal. Mint: British Royal Mint. Obverse: "Al Mamlakah" (Kingdom) written above. CE year on left and AH year on right. Value in center circle. "Al-Iraqiyah" (Iraq) written below. Reverse: "Faisal Al-Tani" (Faisal the Second) written right side clockwise. "Malik Al-Iraq" (King of Iraq) written left clockwise. King Faisal II facing right. Mintage: 20,750,000 + 200 Proofs. Minted Years: one year type. 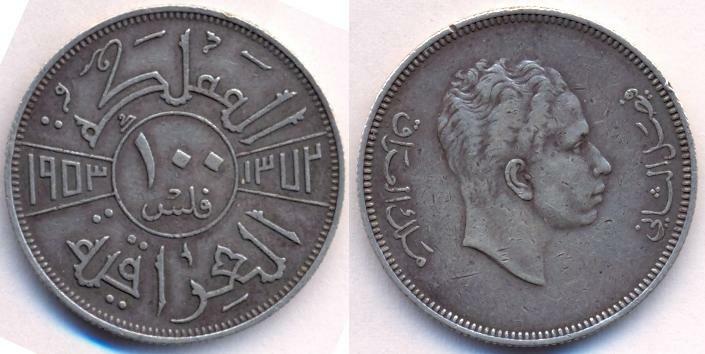 Faisal II, Regency coin. KM#112 10 Fils. Year: 1953 - AH 1372. Weight: 6.75g. Metal: Copper-Nickel. Diameter: Scalloped, 25 mm. Edge: Plain. Alignment: Medal. Mint: British Royal Mint. Obverse: "Al Mamlakah" (Kingdom) written above. CE year on left and AH year on right. Value in center circle. "Al-Iraqiyah" (Iraq) written below. Reverse: "Faisal Al-Tani" (Faisal the Second) written right side clockwise. "Malik Al-Iraq" (King of Iraq) written left clockwise. King Faisal II facing right. Mintage: 11,400,000 + 200 Proofs. Minted Years: one year type. 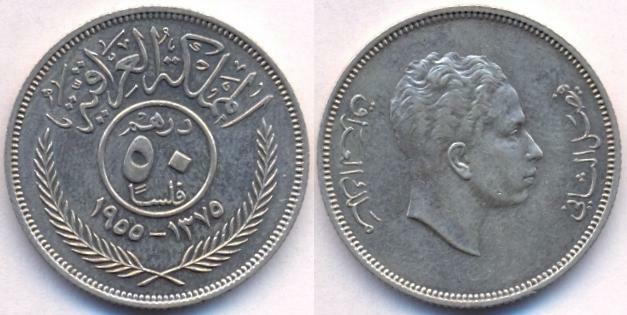 Faisal II, Regency coin. KM#113 20 Fils. Year: 1953 - AH 1372. Weight: 3.60g. Metal: 0.500 Silver. Diameter: 20.5 mm. Edge: Reeded. Alignment: Medal. Mint: British Royal Mint. Obverse: "Al Mamlakah" (Kingdom) written above. CE year on left and AH year on right. Value in center circle. "Al-Iraqiyah" (Iraq) written below. 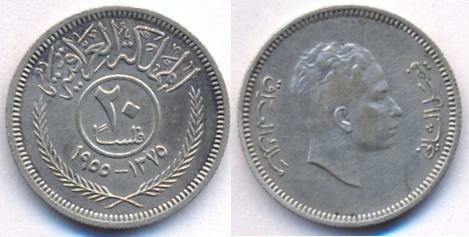 Reverse: "Faisal Al-Tani" (Faisal the Second) written right side clockwise. "Malik Al-Iraq" (King of Iraq) written left clockwise. King Faisal II facing right. Mintage: 250,000. Minted Years: one year type. KM#115 100 Fils. Year: 1953 - AH 1372. Weight: 10.00g. Metal: 0.900 Silver. Diameter: 29 mm. Edge: Reeded. Alignment: Medal. Mint: British Royal Mint. Obverse: "Al Mamlakah" (Kingdom) written above. CE year on left and AH year on right. Value in center circle. "Al-Iraqiyah" (Iraq) written below. Reverse: "Faisal Al-Tani" (Faisal the Second) written right side clockwise. "Malik Al-Iraq" (King of Iraq) written left clockwise. King Faisal II facing right. Mintage: 1,200,000 + 200 Proofs. Minted Years: one year type. KM#114 50 Fils 9.0g 0.500Ag (Mintage: 560,000) is another scarce coin in this series. KM#116 20 Fils. Year: 1955 - AH 1375. Weight: 3.60g. Metal: 0.500 Silver. Diameter: 20.5 mm. Edge: Reeded. Alignment: Medal. Mint: British Royal Mint. Obverse: "Al Mamlakah Al-Iraqiyah" (Kingdom of Iraq) written above. Value in center circle. CE year and AH year below circle and above sprigs. Reverse: "Faisal Al-Tani" (Faisal the Second) written right side clockwise. "Malik Al-Iraq" (King of Iraq) written left clockwise. King Faisal II facing right. Mintage: 4,000,000. Minted Years: one year type. KM#117 50 Fils. Year: 1955 - AH 1375. Weight: 7.00g. Metal: 0.500 Silver. Diameter: 26 mm. Edge: Reeded. Alignment: Medal. Mint: British Royal Mint. Obverse: "Al Mamlakah Al-Iraqiyah" (Kingdom of Iraq) written above. Value in center circle. CE year and AH year below circle and above sprigs. Reverse: "Faisal Al-Tani" (Faisal the Second) written right side clockwise. "Malik Al-Iraq" (King of Iraq) written left clockwise. King Faisal II facing right. Mintage: 12,000,000. Minted Years: one year type. KM#118 100 Fils 1955 10.00g 0.500 Silver (Mintage: 1,000,000) is the rarest coin in modern Iraq coinage. It is believed that most of these pieces were held with the bank vaults when the military coup on took place on 14th July 1958. More than 90% of these coins were never released for circulation.